This classic two strap style makes it easy to slide into comfort. This sandal features soft suede leather straps and foot-molding cork latex footbed. 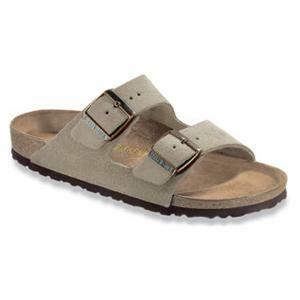 The Birkenstock Soft Footbed features an extra layer of cushioning foam built into our legendary footbed. OUR FEATURED BRANDS AVAILABLE IN OUR STORE / COMING SOON TO OUR WEB SITE!